Acquisition of ports, establishment of coastal trading posts & forts. Companies trade in natural products of the local region. Indigenous systems expanded and redirected. Enslavement of Africans across the Atlantic to work as slaves. Racism invented to legitimize enslavement. Initiated exploration of the interior/settlement of South Africa. Exploration of the interior to catalog perceived resources. Raw materials and food needed for the industrial revolution. State sanctioned acquisition of territory (especially after 1884). Reorganization of production to meet colonizer's needs. Coastal orientation of linear extractive infrastructure. Dual economy of traditional and modern sectors. Siphoning off land & labor from traditional to modern sectors. Adoption of Western models of government/revert to one-party states. Multinationals perpetuate dual economy & system of dependency. Political independence but continued economic/cultural dependence. Extractive infrastructure still geared to primary product exports. Urban development: coastal orientation, administrative centers. Utilitarian materialist philosophy, acculturated elites, modernization. Ethnic identity and the modern nation-state in Africa. Toxic colonialism- dumping toxic waste in less developed countries. This section based largely on pp.72-83 from Aryeetey-Attoh, Samuel, ed. Geography of Sub-Saharan Africa. Upper Saddle River, NJ: Prentice Hall. 1997. 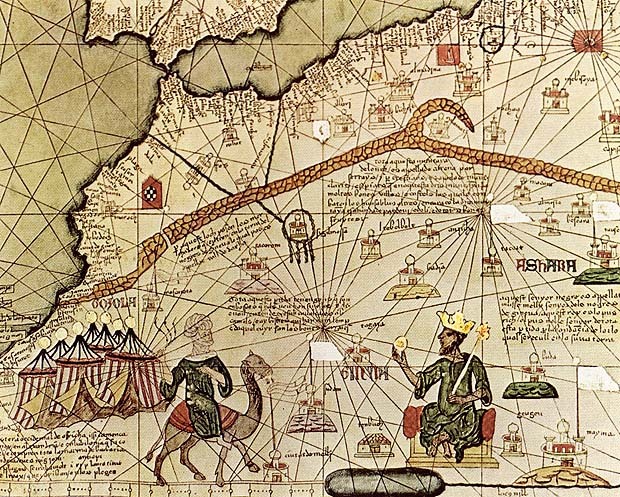 Map with Mansa Musa on his thrown (1375).